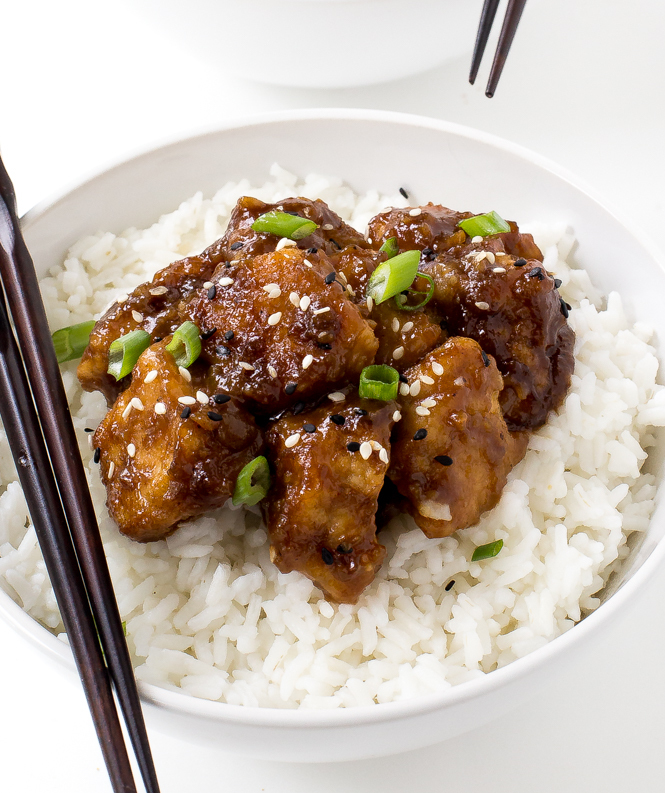 General Tso’s Chicken is my all time favorite take out dish. It’s my go to whenever I order Chinese takeout. I like my General Tso’s Chicken extra saucy so I made sure to add lots of sauce to the chicken. A lot of the sauce does dissolve as it’s cooked and gets super thick thanks to the cornstarch coated chicken. 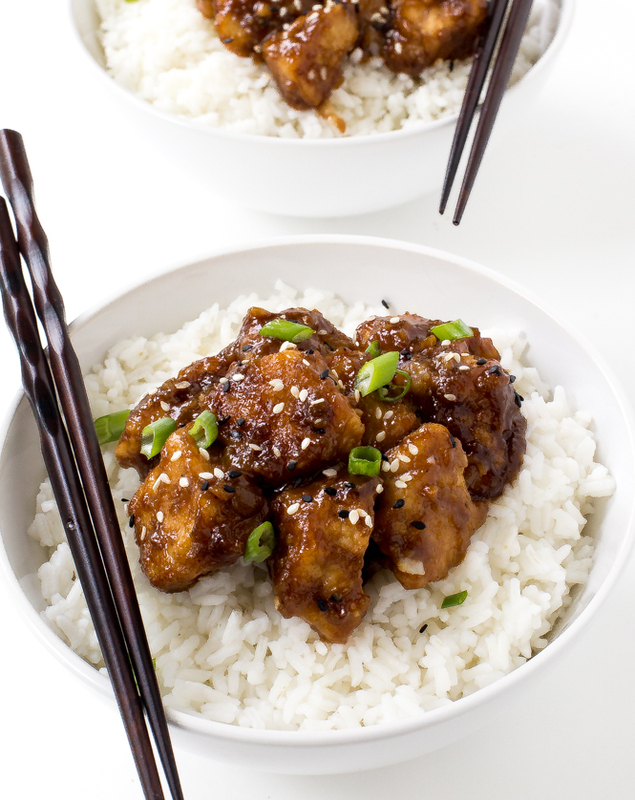 This recipe is also a lot healthier than takeout General Tso’s Chicken. There is no deep frying in this recipe just a little oil to sauté the chicken. 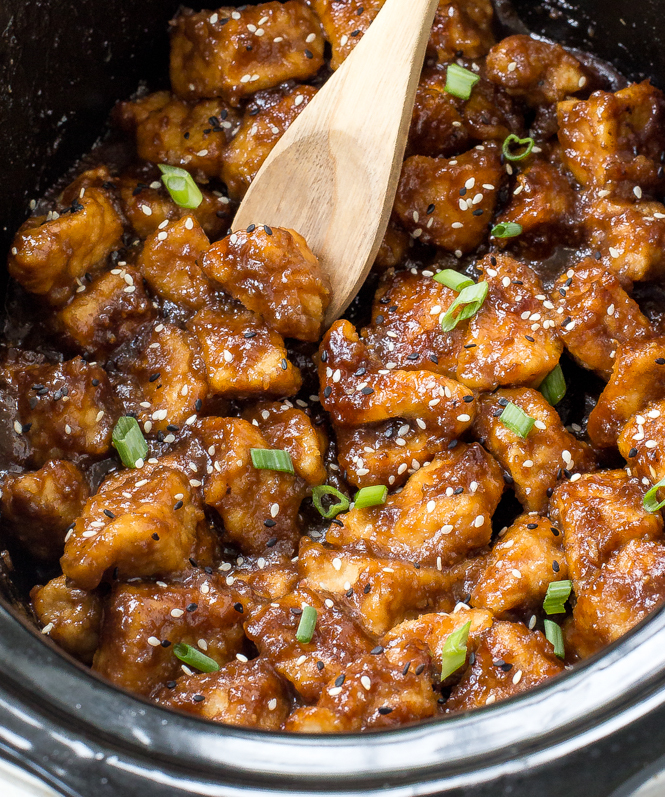 To make this Slow Cooker General Tso’s Chicken start by tossing cubed chicken pieces with cornstarch in a large ziplock bag. Pan fry until golden brown on both sides and add to the slow cooker. Whip up the sauce ingredients together and toss with the chicken. Cook on low for 2-3 hours. For an extra kick serve with some Sriracha sauce or crushed red pepper flakes. Give my other takeout dishes like my Beef and Broccoli, Kung Pao Shrimp and Mongolian Beef a try! I am so happy you enjoyed it Lesley!! Thank you so much for sharing! If it’s ready in 4 hours, why does it say cook at low for 2-3 hours? The recipe was corrected for 2-3 hours. I will correct the typo. So only 1 1/2 hrs in stead of 3? I would check the chicken after 1 1/2 – 2 hours. Did you have it on low for the 1-1.5 hours? Yes I cook it on low. What are nutritional facts per serving for this dish? I do not have the nutritional facts for this recipe. However there is a recipe calorie counter that works pretty well if you would like to plug the recipe into that. I would like to also know that as I am a weight watcher lifetime member and want to make this chicken recipe.. HUH!!? 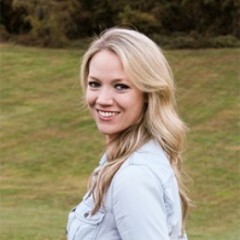 Kelly says cook low 4 hrs. Lesley says cook 1.5hrs. How so? I’d love to make the General Tso’s Chicken & Mongolian Beef recipes, but I’ve been living overseas and cannot use my slowcooker. Do you think I cook make the recipes on my stove top in a dutch oven (one of those very heavy Creuset pans)? I love the flavor of this dish but my chicken was really tough. Can you think of why that would be? I am very sorry that the chicken was tough for you. I have found that the chicken can be take out sooner. I will change the recipe cooking time to 2-3 hours. I appreciate your feedback! Probably need to check chicken at the 1&1/2 hour mark. Most likely it was over cooked. What size slow cooker this recipe is for? I have quite a big one so I must adjust quantity for it. I have one about 5 pints if I’m not mistaken (quite big, I bought a big one on purpose to make extra for lunch and freezer). 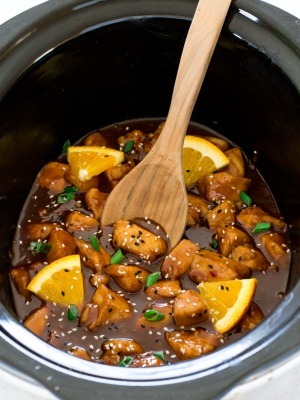 I used a 6 quart slow cooker for this recipe. It came about halfway up the slow cooker. What I like to do is prepare meals ahead of time and freeze them. Afterwards, I put them in the slow cooker when I want to use them. Is it possible to do so with this recipe? I wouldn’t cook the chicken for as long the first time. My worry would be it would be over cooked if you cook it and then reheat it again in the slow cooker. I would maybe cook just until it reaches 165 so maybe 1-1/2 hours. Then cool it and freeze it and reheat in the slow cooker. I hope this helps and you enjoy!! Thanks for your qyick answer. What I am wondering is if I can NOT cook all the ingredients, put them all in a freezer bag and them cook them in the slow cooker when I want to? I have never tried doing that before so it is hard for me to say yes or no that will work. Sorry I couldn’t help more! Going to give this a go tonight, just one question though, how much is a cup? No this dish is not spicy. You can add sriracha or red pepper flakes to this dish to add some spice. I am planning an Asian themed event. I would like to know if the recipe is doubled, should the cooking time change? No the cooking time will not need to change. Thank you & Enjoy! This looks delicious! I like the idea of coating the chicken with corn starch and sauteing it for a short while before adding it to the crockpot. 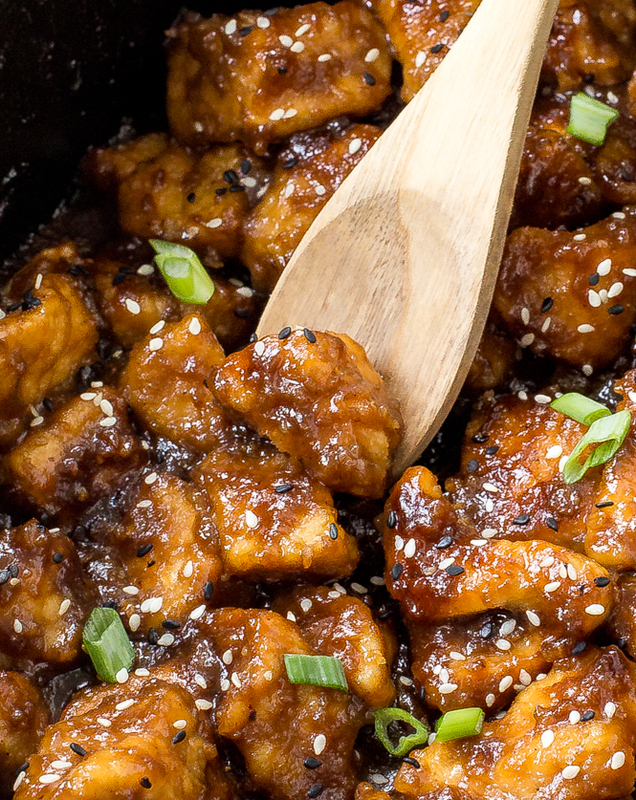 I have tried a few crockpot sesame chicken recipes and my chicken has come out very dry and nothing like a usual sesame chicken. 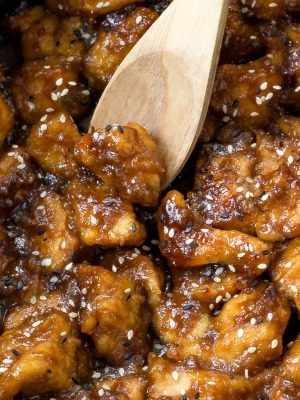 I will have to go this a try….my husband loves General Tsos. Thank you for sharing!! I thought this was delicious! I cut my cooking time down, but the sauce was flavorful and it tasted fantastic. Thanks for sharing the recipe for one of my husband’s FAVORITE take out dishes! I saved this recipe s I can try it! Sounds delicious! You mentioned you like it saucy do you double the sauce portion? Yes I like to double the sauce and serve extra sauce over white rice. Thank you for sharing this yummy recipe. The instructions were very clear and easy to follow. My family loved it! Thank you Brandy! I am so glad you and your family enjoyed it! We couldn’t find rice wine vinegar. Just red wine vinegar one rice vinegar. Would one of these work? You can find rice wine vinegar in the asian section of the grocery store. I would suggest using this over red wine vinegar. Rice wine vinegar and rice vinegar are the same. My husband and I love this recipe. Was really tough cleaning the pot afterward though. Will spray with cooking spray next time and hopefully it will not take as long to clean. Oh my this recipe is AWESOME!!!!!🖒🖒🖒. Will definitely make again, especially since it’s so easy!!!! Hoisin sauce is a thick dark sauce that is full of flavor and is commonly used in Chinese cuisine. You can find this in the grocery store in the international foods isle by the soy sauce. You can also order Hoisin sauce from Amazon.com. I haven’t tried this recipe (YET) but I plan on it within the next few days. How much chicken approximately by weight are we talking about? It will be about 2 pounds. This was delicious! It was done after 2 hours. My only issue was that it was starting to dry out and the sauce was starting to stick, so I just put some chicken broth in. It produced plenty of sauce that way but still stayed thick b/c of the cornstarch. Awesome recipe! This was beautiful, I would say better than takeout too because I knew what was in it AND it was delicious. Cooked the chicken in grapeseed oil before putting in crock pot because I didn’t have veg, but otherwise followed the recipe exact. It took about an 1:40 for mine because I had small cuts, thanks so much for sharing! This is a keeper for sure.